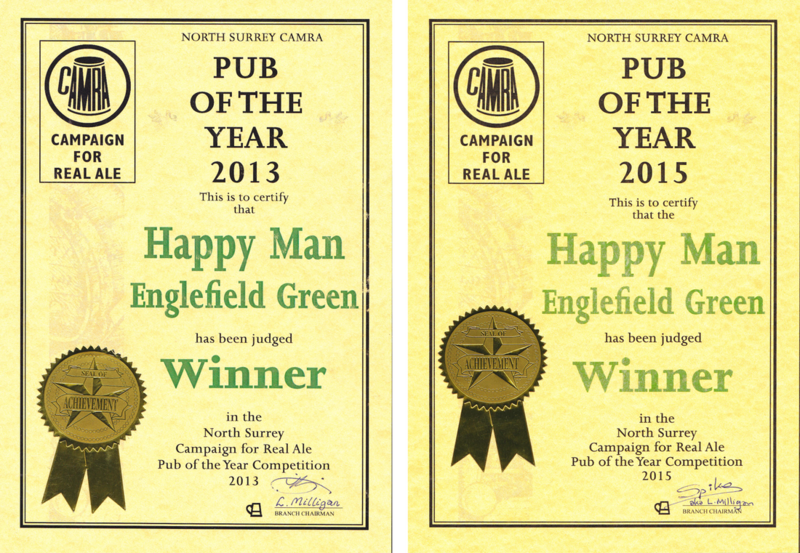 ​Welcome to The Happy Man, a traditional pub located in the centre of Harvest Road, Englefield Green. Just a two minute walk from the campus of Royal Holloway, University of London. The Happy Man. The name says exactly what the pub has been doing for over 100 years – making people happy with a warm welcome, a splash of the grape and the grain and good old-fashioned ‘British’ food, made on the premises. It’s a tradition passed to me by my grandfather, landlord of the pub some 40 years ago. So in dedication to the spirit of this CAMRA-award winning village boozer, a firm favourite of both town and gown, I aim to keep providing the simple things that make people happy - good ale, good food and, of course, good company. ​I look forward to seeing you soon. ​Sunday night is Game Night at The Happy Man! The Happy Man, 12 Harvest Road, Englefield Green, Egham, Surrey, TW20 0QS.